Amanda E. Randolph (September 2, 1896 – August 24, 1967) was an American actress, singer and musician. She was the first African-American performer to star in a regularly scheduled network television show, appearing in DuMont's The Laytons. The Randolph family moved frequently. At the age of 14, Randolph began earning extra money playing piano and the organ in Cleveland, Ohio. Around 1919, she moved to Cincinnati, Ohio where she recorded several piano rolls of hot jazz and blues music for the Vocalstyle company of Cincinnati while working as a musician in Ohio's Lyric Theatre. These are the only known rolls recorded by a black female pianist. Randolph did her work for the company under the name Mandy Randolph. She is shown as the performer of "The Yellow Dog Blues", by W. C. Handy in 1919, Vocalstyle roll # 11562. 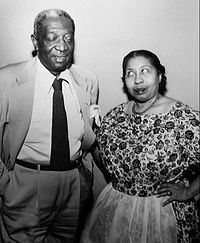 Randolph also wrote music she recorded for the Vocalstyle company; she is shown as both the performer and composer of "I'm Gonna Jazz My Way Right Straight Thru Paradise", and as the co-author of "Cryin' Blues" with H. C. Washington. Randolph also cut audio recordings, accompanied by Sammie Lewis. A record album was produced in 1996 by Document Records called, Blues & Jazz Obscurities (1923-1931), containing the six duets the pair produced. Still working under the name Mandy Randolph, she recorded "Cootie Crawl" (G11425) on April 30, 1923, and "I Got Another Lovin' Daddy" for Gennett Records. She was invited to join the Sissle and Blake musical, Shuffle Along, in New York in 1924 and went on to do Lucky Sambo as one of the Three Dixie Songbirds (sharing the bill with its star, Tim Moore, with whom she later appeared on TV's popular The Amos 'n' Andy Show from 1951–53). in 1925, she was part of Sissle and Blake's The Chocolate Dandies. Randolph then worked in musicals at New York's Alhambra Theater until 1930, following that with work in Europe and England for a year. Randolph worked on the vaudeville and burlesque circuits as a comedian and as a singer, noting that Abbott and Costello also got their start the same way. Randolph took a four-year hiatus from show business in 1932; she married and helped her husband run their restaurant in New York called The Clam House, which was a favorite of those in the entertainment industry. She then returned to performing, playing piano at a Greenwich Village club called The Black Cat. She made more records, this time recording for Bluebird Records. The label began in 1932 and was owned by RCA Victor Records. She did the vocals with her own band, billed as Amanda Randolph and her Orchestra. The records were made in New York City on October 8, 1936. On that date, Amanda cut: "Please Don't Talk About My Man" (Bluebird 6615), "Doin' The Suzie-Q" (Bluebird 6615), "Honey, Please Don't Turn Your Back On Me" (Bluebird 6616), "For Sentimental Reasons" (Bluebird 6617), "He May Be Your Man But" (Bluebird 6617), and "I've Got Something In My Eye", (Bluebird 6619-B). She also recorded "After Hours"; some of these songs can be heard on radio station KBRD which also broadcasts on the internet. Randolph's film career began in 1936 with Black Network. She went on to do several Oscar Micheaux films, among them: Swing, Lying Lips and The Notorious Elinor Lee. Broadway roles in The Male Animal and Harlem Cavalcade soon followed. Around the same time, Randolph broke into radio, helped by people she met at The Clam House, who got her a CBS audition. She began working on various radio shows: Young Dr. Malone, Romance of Helen Trent and Big Sister. She went on to become a regular cast member on Abie's Irish Rose, Kitty Foyle, and Miss Hattie with Ethel Barrymore, where she had the role of Venus. Randolph also appeared on Rudy Vallée's radio show and on Grand Central Station. She continued working in films until the 1960s, and was one of the first black women to become a comedy favorite on television. Randolph was the first African-American performer to star in a regularly scheduled network television show, appearing in DuMont's The Laytons. 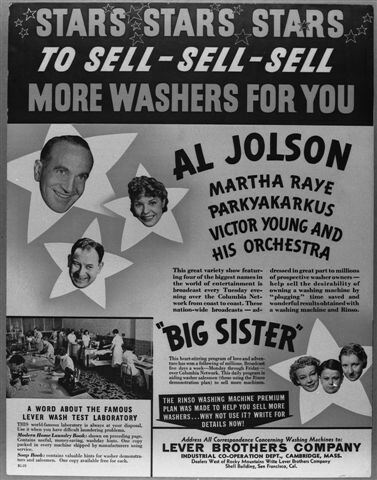 This short-lived program was on the air two months in 1948. During the 1948-1949 television season, Randolph starred for about a year in her own daytime musical TV program for DuMont, Amanda, which aired Mon-Fridays from 12noon to 12:15pm ET, making her the first African-American woman with her own show on daytime television. Randolph did not settle in California until 1949, when she earned a role in Sidney Poitier's No Way Out. Even though she was working in New York and her younger sister, Lillian, had been working in Hollywood for some time, newspapers often got the two sisters mixed up, doing a story on Amanda but with a photo of Lillian and vice versa. She then became a regular on the early TV series, The Amos 'n' Andy Show, as Sapphire's mother, Ramona Smith, from 1951 to 1953; she also played the same role for the show's radio version from 1951 to 1954. Randolph then began working with her sister, Lillian, who played Madame Queen on the radio and television shows. She was the star and titular character in The Beulah Show from 1953 to 1954, assuming the role from Lillian. Randolph also did some work for CBS Radio Workshop in 1956, playing the role of the folk heroine Annie Christmas in The Legend of Annie Christmas. Randolph had a recurring role as Louise the Maid on CBS's The Danny Thomas Show and appeared in the show's 1967 reunion program, which aired shortly after her death. She guest-starred on the NBC anthology series, The Barbara Stanwyck Show. In 1955, Amanda opened a restaurant in Los Angeles called "Mama's Place", where she did the cooking. Despite all her film and television work, Randolph found herself slightly short of the requirements for a much-needed Screen Actors Guild pension at the age of 70 (both sisters had struggled for roles in the late 1930s). A role was written for her to gain eligibility. She married Harry Hansberry sometime after 1940. Hansberry was the owner of the "Hansberry's Clam House" (aka "Edith's Clam House") at 146 West 133rd Street, New York City's most famous gay speakeasy in Harlem, The couple had two children before separating. They were estranged when Hansberry died of a heart attack in 1961. Randolph died of a stroke in Duarte, California, on August 24, 1967, aged 70. She is survived by a son, Joseph, and a daughter, Evelyn. She is interred at Forest Lawn Memorial Park in the Hollywood Hills beside her sister, Lillian. ^ Steve Gibson, with his Rhythm and Blues group, The Five Red Caps, was said to be a brother. However, this cannot be substantiated. in an episode "Claire", of the 1950s series "Screen Directors Playhouse", her first name was misspelled as "Armanda". ^ Rea, E. B. (January 10, 1948). "Does Radio Give Our Performers a Square Deal?". The Afro American. Retrieved October 17, 2010. ^ Witbeck, Charles (September 1, 1969). "Madame Queen Joins Cosby". The Evening Independent. Retrieved October 19, 2010. ^ "The Five Red Caps". Singers.com. Retrieved 10 October 2010. ^ New York Beat. Jet. 31 December 1953. Retrieved 10 October 2010. ^ "Stage Gossip-Cincinnati Ohio". The Freeman. March 27, 1915. Retrieved January 17, 2011. ^ a b c d e Dier, Richard (July 17, 1945). "Amanda Randolph Clinches Radio Role". The Afro American. Retrieved October 21, 2010. ^ "Search for "Randolph" at website's Piano Roll Artists Database". pianola.co.nz. Archived from the original on June 29, 2011. Retrieved October 17, 2010. ^ ""Cryin' Blues" - Mandy Randolph". MusicWeb International. Retrieved October 17, 2010. ^ "I'm Gonna Jazz My Way Right Straight Thru Paradise". Answers.com. Retrieved October 17, 2010. ^ "The History of Piano Jazz, CD 1". MusicWeb International. Retrieved October 17, 2010. ^ "Blues & Jazz Obscurities (1923-1931)". Amazon.com. Retrieved October 17, 2010. ^ "Gennett 5000-5500 Numerical Listings". Online Discographical Project. Archived from the original on November 23, 2010. Retrieved November 22, 2010. ^ "Finding Aid for the Gennett Collection". Online Archive of California. Retrieved October 19, 2010. ^ Peterson, Bernard L., ed. (1997). The African American Theatre Directory, 1816-1960: A Comprehensive Guide to Early Black Theatre Organizations, Companies, Theatres, and Performing Groups. Greenwood Press. p. 336. ISBN 0-313-29537-9. Retrieved October 21, 2010. ^ "Royal". The Afro American. June 18, 1927. Retrieved October 21, 2010. ^ "Musical Comedy Coming to Grand". The Telegraph-Herald. February 4, 1925. Retrieved January 17, 2011. ^ "This Week In The Theatres". The Afro American. July 14, 1928. Retrieved October 21, 2010. ^ a b c d "Amanda Randolph". The Sherbrooke Telegram. October 8, 1953. Retrieved October 21, 2010. ^ "Amanda is Toast Of Ship". The Afro American. April 26, 1930. Retrieved October 21, 2010. ^ Peterson, Bernard L., ed. (1993). A Century of Musicals in Black and White: An Encyclopedia of Musical Stage Works By, About, or Involving African Americans. Greenwood Press. p. 560. ISBN 0-313-26657-3. Retrieved October 21, 2010. ^ "Billy Mitchell Now On The Air". The Afro American. August 22, 1931. Retrieved October 22, 2010. ^ "Amusements-Vaudeville At Park". Reading Eagle. September 26, 1932. Retrieved September 20, 2010. ^ "'Love Thieves' Not Musical Comedy". The Montreal Gazette. December 9, 1930. Retrieved September 20, 2010. ^ Pfeffer, Murray L. "My Harlem Reverie". nfo.net. Archived from the original on November 27, 2010. Retrieved October 22, 2010. ^ Ross, George (July 19, 1938). "Broadway". The Pittsburgh Press. Retrieved October 21, 2010. ^ Mason, Ralph (April 21, 1959). "Night Clubs To Broadway In 26 Years". Baltimore Afro-American. Retrieved October 21, 2010. ^ a b "Something In My Eye-Amanda Randolph Orchestra". Internet Archive. Retrieved November 22, 2010. ^ a b "Hit of the Week-Extra". Dismuke Radio. May 2004. Archived from the original on November 2010. Retrieved November 22, 2010. ^ "Bluebird numerical listings 6500-7000". Online Discographical Project. Archived from the original on November 23, 2010. Retrieved November 22, 2010. ^ "Titles By Artist". KBRD Radio. Archived from the original on April 17, 2010. Retrieved November 22, 2010. ^ "'Black Network' Shows on Screen at the Harlem". The Afro American. April 18, 1936. Retrieved October 21, 2010. ^ "The Black Network". Weird Wild Realm. Retrieved November 10, 2010. ^ "Amanda Randolph". BlackPast.org. Archived from the original on October 11, 2010. Retrieved October 21, 2010. ^ a b McCann, Bob, ed. (2009). Encyclopedia of African American Actresses in Film and Television. McFarland. p. 461. ISBN 0-7864-3790-1. Retrieved October 19, 2010. ^ "Famous Players In New Sepia Arts Picture". The Afro American. April 13, 1940. Retrieved October 21, 2010. ^ Wilson, Cleon (May 5, 1942). "Cavalcade Scores On Broadway". The Afro American. Retrieved October 21, 2010. ^ "Copy of promotional material for 'Big Sister'". museumoffamily history.com. Retrieved October 22, 2010. ^ MacDonald, J. Fred. "Don't Touch That Dial! radio programming in American life, 1920-1960". fredmacdonald.com. Archived from the original on November 2, 2010. Retrieved October 21, 2010. ^ Steinhauser, Si (March 17, 1944). "Morton Downey Sings Tunes of 'Ould Sod'". The Pittsburgh Press. Retrieved January 17, 2011. ^ Brooks, Tim & Marsh, Earle (2007). The Complete Directory to Prime Time Network TV Shows (9th ed.). New York: Ballantine. ISBN 0-345-31864-1. ^ a b Coleman, Robin R. Means, ed. (1998). African American Viewers and the Black Situation Comedy: Situating Racial Humor (Studies in African American History and Culture). Routledge. p. 384. ISBN 0-8153-3125-8. Retrieved October 10, 2010. ^ a b Fearn-Burns, Kathleen, ed. (2005). Historical Dictionary of African-American Television (Historical Dictionaries of Literature and the Arts). The Scarecrow Press. p. 584. ISBN 0-8108-5335-3. Retrieved October 10, 2010. ^ Handelman, Jay (February 8, 2000). "The fight for TV With Color". Star-News. Retrieved January 16, 2011. ^ "Primetime Blues". New York Times. 2001. Retrieved March 8, 2011. ^ Cassidy, Marsha F. (2005). What Women Watched Daytime Television in the 1950s. University of Texas Press. p. 35. ISBN 978-0-292-70626-2 – via Project MUSE. ^ "Amanda". Internet Movie Database. Retrieved October 10, 2010. ^ Gates, Henry Louis Jr.; Higgenbotham, Evelyn Brooks, eds. (2009). Harlem Renaissance Lives. Oxford University Press. p. 608. ISBN 978-0-19-538795-7. Retrieved July 23, 2011. ^ Sterling, Christopher H., ed. (2003). Encyclopedia of Radio 3-Volume Set. Routledge. p. 1696. ISBN 1-57958-249-4. Retrieved October 12, 2010. ^ Ford, Del (September 27, 1953). "Stars shine tonight to salute Community Chest". St. Petersburg Times. Retrieved January 16, 2011. ^ "CBS Radio Workshop-Program #38". DigitalDeliToo. Archived from the original on January 15, 2015. Retrieved December 2, 2010. ^ Crosby, Joan (November 6, 1967). "Old Pals Rejoin Danny". The Pittsburgh Press. Retrieved October 21, 2010. ^ New York Beat. Jet. May 19, 1955. Retrieved October 10, 2010. ^ People Are. Jet. July 28, 1966. Retrieved October 10, 2010. ^ New York Beat. Jet. August 28, 1966. Retrieved October 10, 2010. ^ Bogle, Donald, ed. (2006). Bright Boulevards, Bold Dreams: The Story of Black Hollywood. One World/Ballantine. p. 432. ISBN 0-345-45419-7. Retrieved October 17, 2010. ^ Garber, Eric. "A Spectacle in Color: The Lesbian and Gay Subculture of Jazz Age Harlem". University of Virginia. Retrieved November 13, 2010. ^ Veteran Actress Amanda Randolph Dies After Stroke. Jet. September 7, 1967. Retrieved October 10, 2010. ^ Wilson, Scott (2016). Resting Places: The Burial Sites of More Than 14,000 Famous Persons, 3d ed. (2 volume set). McFarland. p. 613. ISBN 978-1-4766-2599-7. Retrieved January 25, 2017. Wikimedia Commons has media related to Amanda Randolph. Index of radio shows Amanda Randolph performed in David Goldin. The Beulah Show at Internet Archive-1954.